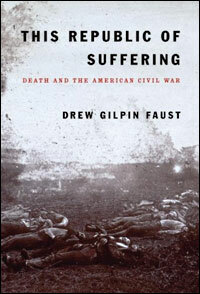 Drew Gilpin Faust, an important American women’s historian and now president of Harvard University, was Terry Gross’ guest on Fresh Air today to discuss her new book, This Republic of Suffering: Death and the American Civil War. You can hear the interview at no charge–just click the link! From her description and Gross’s questions, it sounds like it is an important contribution to the new historiograpy of the body as well as a fascinating exploration of the nineteenth century culture of death–religious beliefs, material culture, and burial practices. Interestingly, Gross asked Faust if her own experiences with breast and thyroid cancer influenced her interest in death as a historical subject. (Her answer? Yes, undoubtedly.) Gross said at the end of the interview that Faust declined to discuss the controversy that led to the dismissal of her predecessor as Harvard president, Lawrence Summers. I’ve tagged this as a post on bodily modification, in part because of the disfiguring injuries suffered by Civil War soldiers (which Faust discusses in passing during the interview), but also because it was Civil War surgeons who invented the surgical sub-specialty of plastic surgery. There was a small but excellent exhibition on this at the National Museum of Health and Medicine, on the campus of the Walter Reed Army Medical Center and the Armed Forces Institute of Pathology in Washington D.C. back in the early 1990s. Even now there are (perhaps the same?) permanent exhibitions there on medicine in the Civil War. I remember them as being very good, and very responsible and eighth-grade hygiene class-ish compared to the freakshow at Philadelphia’s Mutter Museum. Historiann used to live right around the corner from the Museum, which is housed at the College of Physicians of Philadelphia, and have nightmares about the giant distended colon on display there. Uh-oh. Colon nightmares sound pretty severe. I’m glad my nightmares don’t feature disembodied internal organs. It sounds like an interesting interview, though I tend to find Terry Gross annoying. I’m the only one I know who feels this way, though. She’s too perky for my taste. Terry Gross, if you’re reading this–I love you, I’ve been listening for twenty years, since I was just a slip of a girl. I’ve got a new book out too–call me?